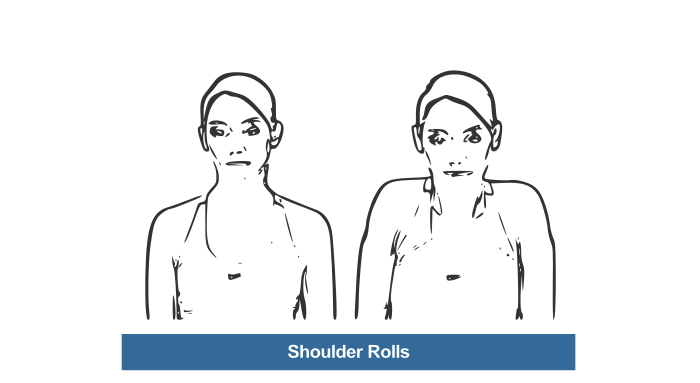 Can exercises for cervical spondylosis help in managing an early-stage cervical spondylosis condition? Yes and the sooner you start, the better! 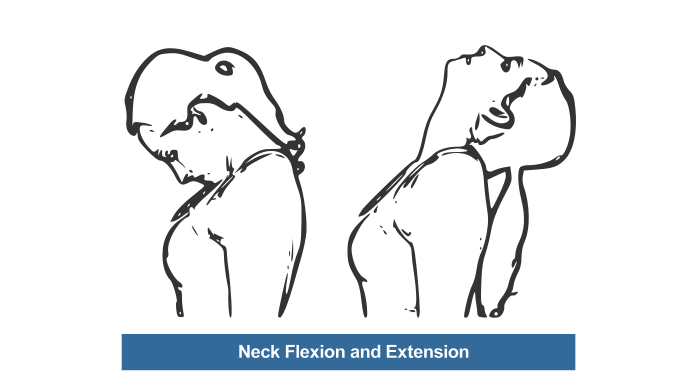 Get to know how about top 10 exercises to get relief from Cervical Spondylosis pain. Neck pain medically termed as ‘cervical spondylosis’, has become a common problem, experienced by most of us at some point in our lives. It is an age-related medical problem, mostly seen above the age of 40. 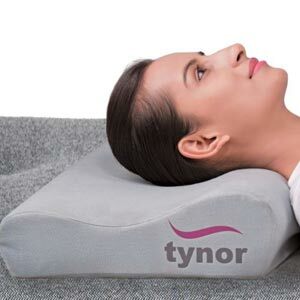 A modern lifestyle that can involve longer working hours and lack of both exercise and rest is causing people to suffer from neck pain at a much younger age. Cervical spondylosis is a degenerative condition which occurs due to the wear and tear of the cartilages and bones of the cervical spine. It is also referred as cervical osteoarthritis or neck arthritis. Here are 10 types of cervical spondylosis exercises you can try for relieving cervical spondylosis or neck pain. Workout smooth and gently throughout while performing each exercise. Avoid sudden movements which could hurt even more. Exercises for spondylosis can be broadly classified into three different types, namely Flexibility Exercises, Isometric Exercises and Stretching Exercises. In isometric exercises, the hand provides resistance. It is important to begin these exercises in an erect position. 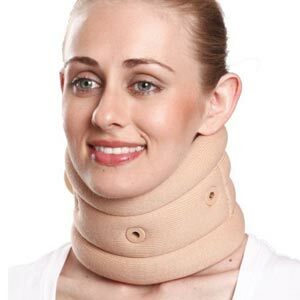 So, sit up straight and slightly tuck your chin before beginning. 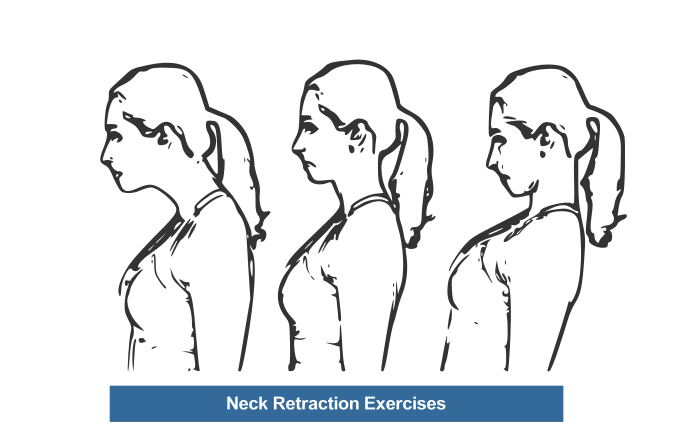 Neck stretching exercises are necessary to maintain good posture and to prevent neck injuries. 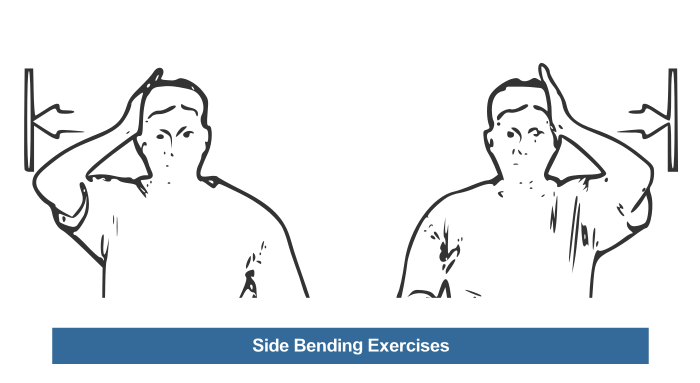 Given below are a group of isometric exercises that may be beneficial to relieve and prevent cervical spondylosis or (neck pain) and enhances to build strength, flexibility, and increase the range of motion. Place your palms at the base of the head and apply light forward pressure. Meet the resistance with your head and neck. Place the index and middle fingers of both your hands in between your eyes, and apply light backward pressure, meet the resistance with your head and neck. Sit erect with your head in a neutral position; place your palms above/around the ear. Apply light pressure with the hand and meet the resistance with the head. Take right ear towards right shoulder until a stretch is felt on the left side. Add to stretch by adding little pressure from the right hand and ensuring left shoulder is kept down. Just a gentle stretch should be felt. Repeat on opposite side. Hold for 10 to 15 sec for each side. 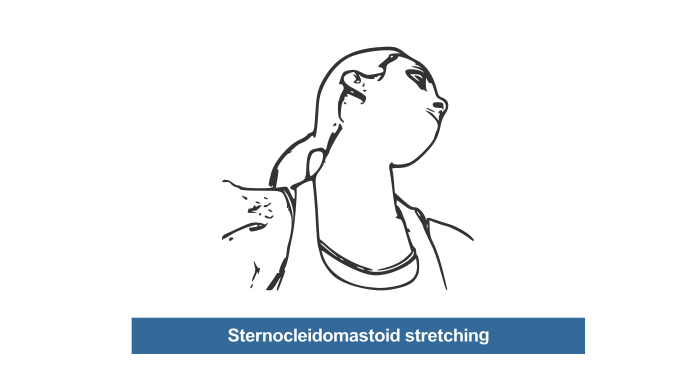 The sternocleidomastoid is the large, rope-like muscle at the front of each side of the neck. This becomes tight with a forward head position. Stretch by looking over the right shoulder, and then tilting the head back. Repeat on opposite side. Hold for 10 to 15 sec for each side. 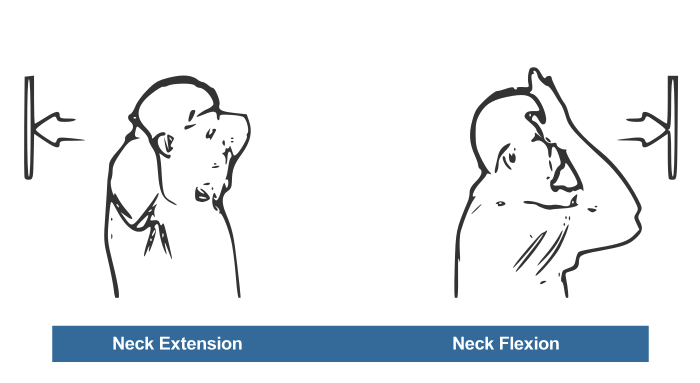 Regular exercises to enhance flexibility, motion, and strength of the neck. Always take some mini breaks (5-10 min) while working on the computer or any other activity that requires continuous sitting. Always use a thin pillow and firm mattresses. When getting up from lying position, always take a turn to one side first, and then get up. If the pain is acute, then take medicines as directed by your doctor, immobilize the neck and take complete rest. Do not run or do strenuous exercises if you are a suffering from neck pain or cervical spondylosis. Avoid sitting for a prolonged time in one position. Do not drive for extended periods. Avoid bad roads, if traveling by two or four wheeler. Avoid taking more than one pillow under the head. Avoid lifting the heavy weight on the head or neck. Move your feet first when you turn around; instead, avoid twisting your body or head while you turn around. Avoid sitting for a prolonged time in stressful postures. 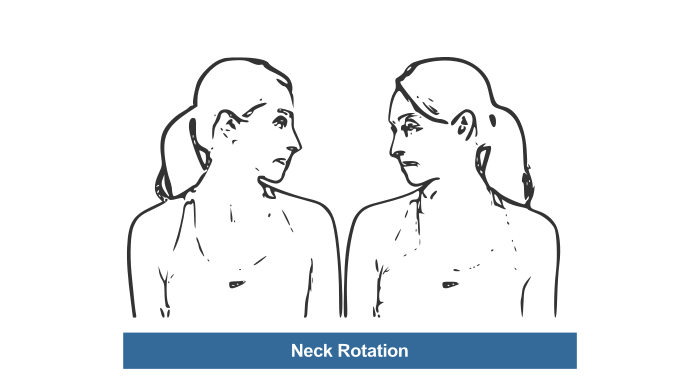 Cervical Spondylosis, Osteoarthritis Cervical Spondylosis, cervical spondylosis exercises, neck exercises for cervical spondylosis, Neck pain. permalink. i m suffering from neck pain along with head pain (heaviness of head back side front as well), i had commit to MRI on 2016 finally report shown “straightening of cervical is seen”. 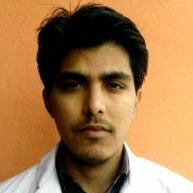 i had taken many treatment but not satisfactory result comes to me till now. therefore this is kindly request to you may please advice for above problems. Please contact [email protected] or WhatsApp 9640378378 to share MRI and other details. Thank you doctor for the best advice. Very helpful exercises. Thank you for the presentation. Pictorial images helped understanding the method of exercising. Thank you doctor for the best advice. I’m so happy. Nice materials.Informative, simple and effective.